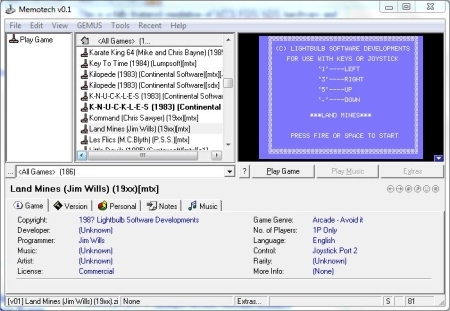 There are a number of emulators available which allow Memotech games and other software to run on more modern computers. 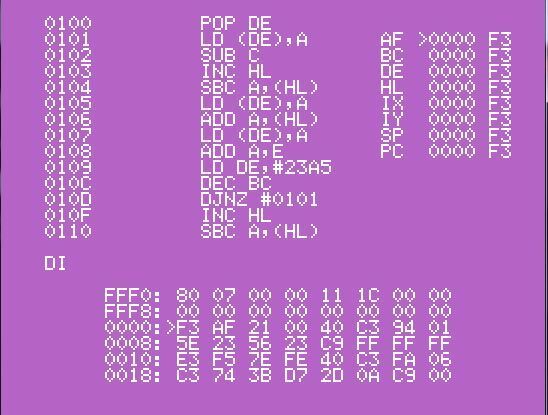 Most software emulators require a copy of the original machine's ROMs which are not in the public domain. 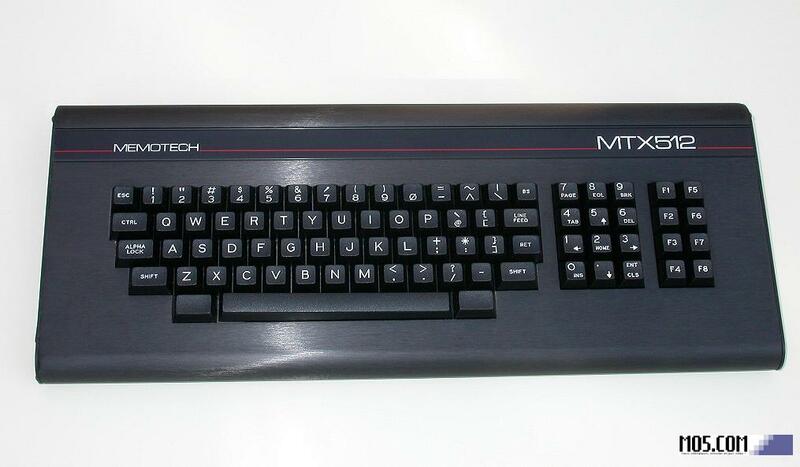 The MTX ROM images can be found on the ROMs page, strictly speaking, you should already own a copy of the ROMs, i.e., the corresponding Memotech MTX computer hardware, in order to legally download the ROMs, although some emulators distribute them inside the package and the original copyright holder is long since gone. Please follow the link to Andy's site to download MEMU. MEMU is a fully featured emulation of MTX/FDX/SDX hardware and is undoubtedly the best emulator available, written and maintained by an ex-Memotech programmer and modern day MTX expert. MEMU is very powerful and supports a host of command line options to optimise the running of the emulator, depending on the hardware being emulated or the software being used. A small penalty for this flexibility is that you need to specify the right command line options. GameBase is essentially a database application which, in it's own words "is an emulator front-end and database utility. You can use it to catalogue, browse and play all of your favourite old games from the golden age of videogaming." The latest version of GameBase is available from SourceForge or you can download the Version 1.3 Setup program from here. 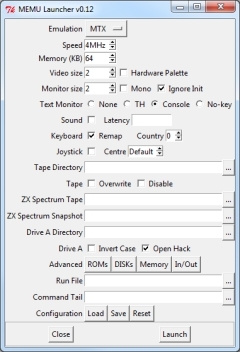 Paul Daniels has created a "GameBase" database for Memotech which makes loading Memotech games easy - all of the required command line options are preconfigured in the MTX GameBase. Paul has generously allowed me to make his efforts available for download here. The GameBase includes screenshots of most of the MTX software, often showing the required keys to control the game. The Version 0.1 download includes only the GameBase database, not the associated software & games. You need to download and install both the MEMU and Gamebase programs in order to use the Memotech GameBase database. This file contains scans of a number of the original game tape covers which can be displayed from within the GameBase too. (This file is a 20MB .rar download). 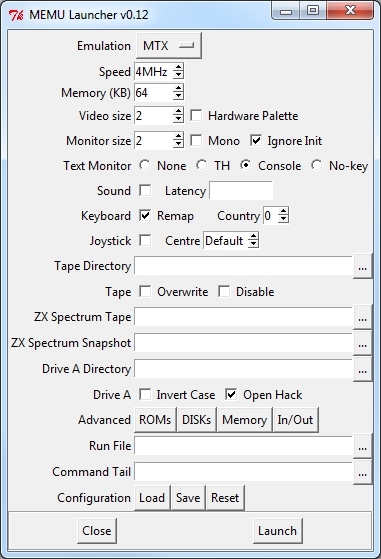 The Version 0.2 download includes the games, application programs, tape covers etc., and is 232MB ! Python is an open source, high level programming language, maintained by The Python Software Foundation (PSF). Available for a number of platforms, including Linux and Windows, it can be downloaded from the PSF website here. Development of the Launcher is now finished, it supports all of the "standard" MEMU options, with the exception of the "advanced" options to create various diagnostic windows. "Advanced" users are likely to prefer the command line for invoking those options anyway. For the rest of us, Launcher provides a great "front end" for MEMU and saves having to use the powerful, but sometimes cryptic, command line options. NB : You will need to edit the pathnames as required to suit your MEMU file locations. Check the ROMs and Disks paths! 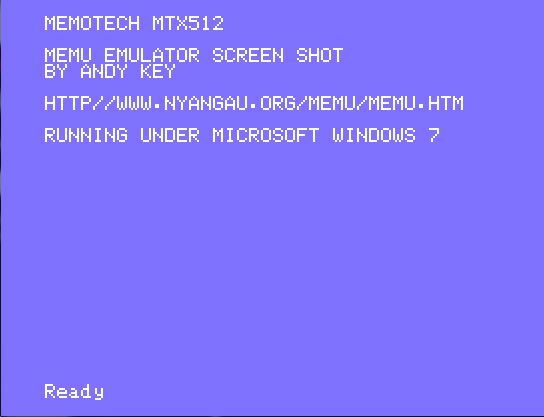 Just specify the "Run File", e.g., "ca.mtx"
Loads Andy's System disk as "A" and his Games disk as "C"
Alternative Emulators - but you should really be using MEMU! It is here for completeness, but you should really be using MEMU!